There are so many different ways this deck can be used for kids at school! When you are working in a school setting, you can use the cards during 1:1 meeting with kids to help them identify which skills work for them, and to help them find new skills to expand their strategies for coping. When you’re working in a small group, you can use the cards as a way to guide your group. You can practice skills together like deep breathing, or imagine a favorite place, or make a calming jar. Also, during individual meetings or small groups, the character cards can be used as a starting point for discussions. You can talk about some scenarios kids may face during the day at school. Then ask about what they think the characters would do if they’re experiencing those feelings or situations. "What other things do you think Dexter could do when he’s feeling upset?" 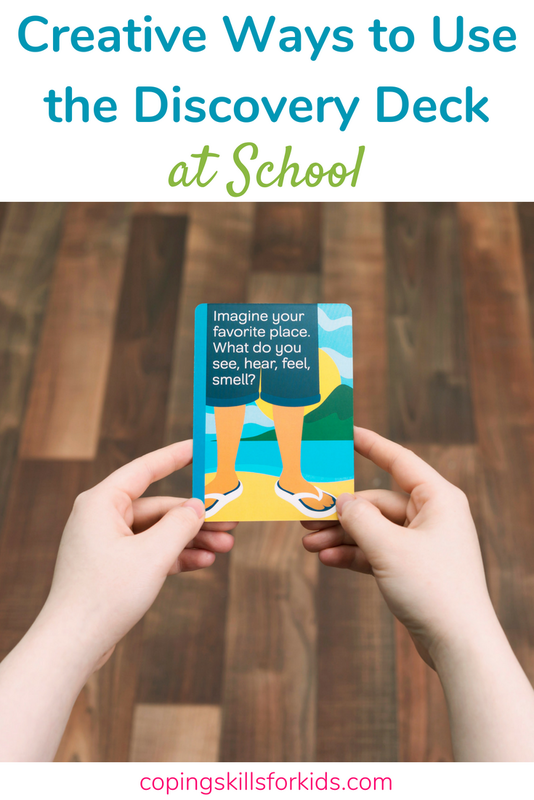 In the classroom, a child could have a few cards in their desk as a visual reminder of strategies they can use. The Discovery Deck would also be a great addition to a coping skills toolkit for a particular child, or a calm down space in a classroom. One of my favorite things about the Discovery Deck is that it’s sorted into 5 Coping Styles: Relaxation, Distraction, Movement, Processing, and Sensory. This makes it much easier to sort through to the mountain of ideas for coping strategies that might work for kids. Soon, Coping Skills for Kids will have a separate deck of cards for each of these Coping Styles, with 40 more skills in each one. The Relaxation Deck is up first and will be available in late summer 2018. Be sure to sign up for our newsletter to be the first to know when that’s happening!